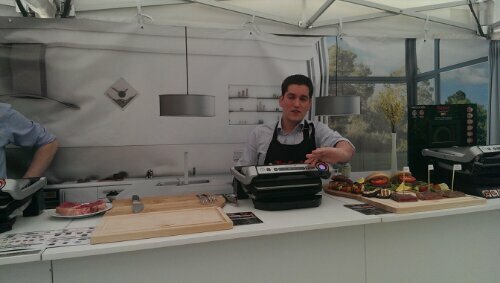 The Tefal OptiGrill is one of the many Tefal products I’ve had the privilege of testing out, as a Tefal Innovation Panellist. 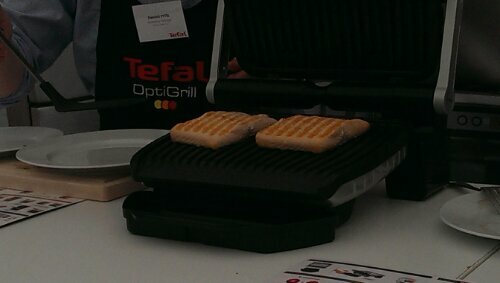 The Tefal OptiGrill, was years in the making, as it’s quite a genius piece of kitchen kit! This review will talk about the original model and I will mention the most recent model (and where to buy it) towards the end of this post. The Tefal OptiGrill then preheats itself to the correct temperature and bleeps to let you know when it’s ready. 4. You pop in your steak (or whatever you are cooking) and press OK. 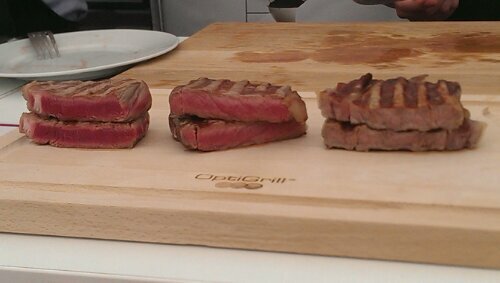 The Tefal OptiGrill then measures the thickness and size of the piece of steak. It sears it at a high temperature to lock in all the flavour, then it drops it’s own temperature to what it needs to be, to cook the steak. 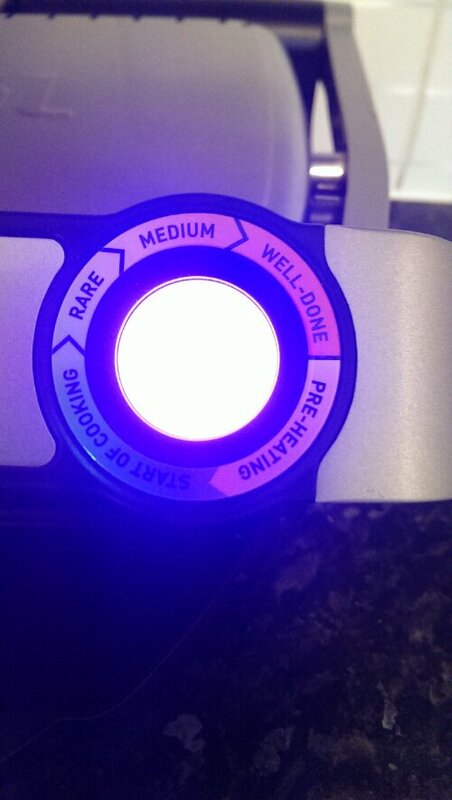 When it reaches each phase of cooking (Rare/Medium/Well Done) it bleeps at you, to tell you to take the steak out. There is also a large LED light which changes colour during the process. That’s it. It really is as simple as that. No more guesswork with steak preferences. No more needing to probe meat to check it’s done. You don’t EVER have to adjust the temperature or tell the machine how many pieces of steak you’ve put in. 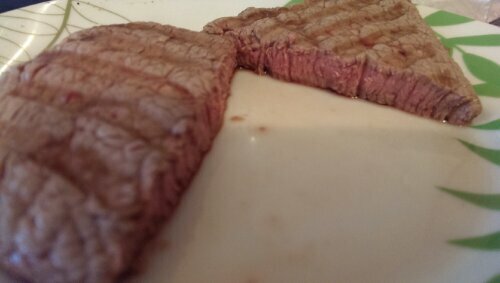 You never have to check it half way through cooking or cut into a steak to see how well it’s cooked. Put quite simply… it just does it all for you. And if you forget to turn it off after you’ve removed your steak… it’ll do that by itself too! There are preset buttons for burgers, chicken, bacon, sausages, steak and fish. For everything else (paninis, prawns etc) there’s a “Manual Mode” button. There’s even a defrost button, so if you forgot to take your bacon out the freezer, you can defrost it in the OptiGrill too! The OptiGrill’s plates are removable and dishwasher safe, as well as being non-stick. 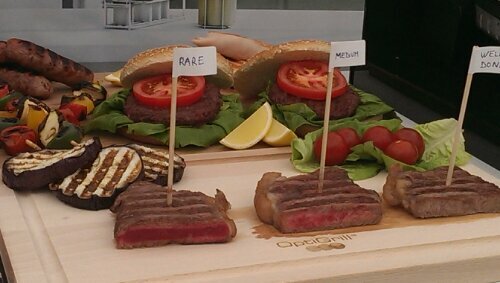 I tried it myself with a small piece of Rump steak. 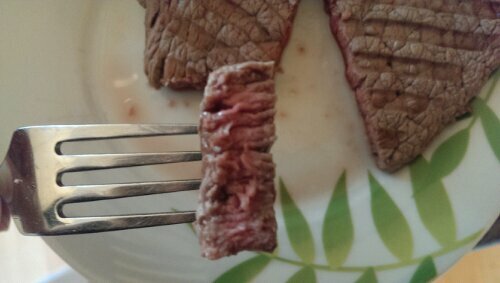 I like my steak medium. The preheating took around 8 minutes. The cooking… took 3 minutes! When I got it out, it was literally perfect. Moist, tender, flavourful and most definitely Medium! 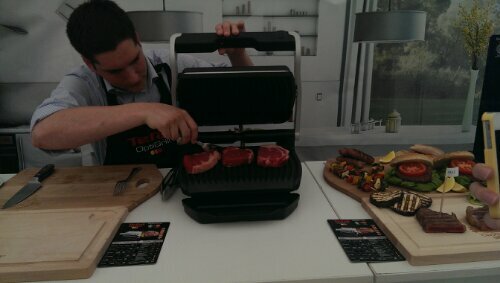 I personally think the Tefal OptiGrill is absolutely genius! Especially if you are entertaining guests – you can cook all their steaks at the same time – but still cook them to their liking! Also because I find it hard to cook steaks to the right preference anyway, and if steak is over-cooked… it’s ruined! 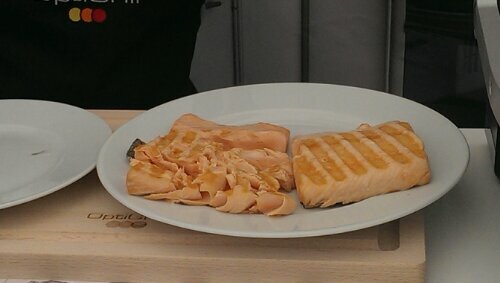 I also love salmon and this is a much quicker way of cooking it. If you have a weak spot for burgers and like to make your own (which often end up all different shapes and sizes), this will be great for cooking those too. 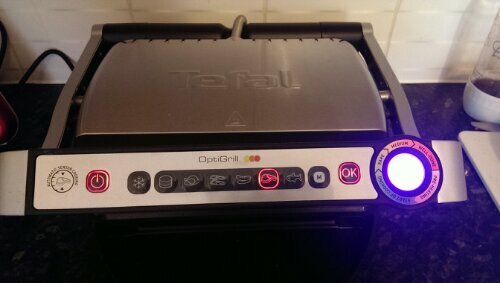 I’ve made a 30 second video of some brief snapshots of the Tefal OptiGrill in action! (please note they are only a snapshot – they are not sequenced in the correct order). After publishing this post, we decided we fancied steak for dinner… so my 6 year old cooked it for us! It’s THAT easy! 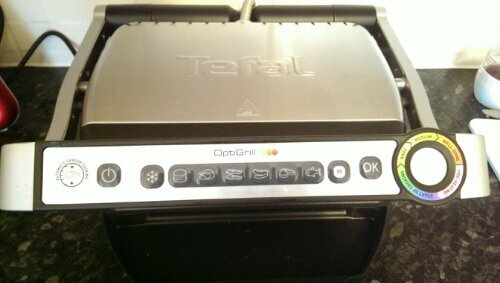 Six years on from publishing this post, my Tefal OptiGrill still gets used regularly. It’s still in brilliant condition, due to those easy clean, non-stick plates and it still works perfectly. This is a really fantastic product and well worth the cost. If you’d like to buy one yourself, please buy it through my affiliate link here. This means I will get a very small bonus for recommending the product, but it will not affect the price you pay. 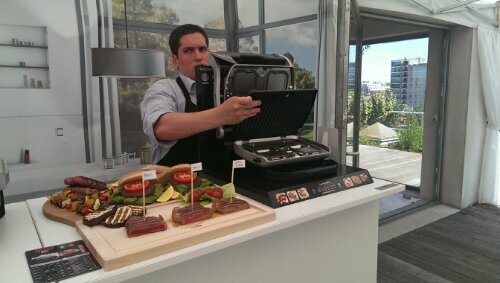 There is now also the Tefal OptiGrill XL, which has 33% more grilling space and even more functions, including burgers, red meat, sandwich, sausage, fish, poultry, seafood, bacon and pork. This entry was posted in Food, Reviews, Videos and tagged cook bacon, cook burgers, cook sausages, cooking fish, grilled food, grilling steak, healthy cooking, how to cook the perfect steak, kitchen appliances, OptiGrill, technology, Tefal, Tefal Innovation Panel, Tefal Innovations, Tefal OptiGrill. Bookmark the permalink. We have had steak and burgers on it and love it so far. I am going to try some frozen and fresh fish on it next week. I have a question about another product by Tfal. It is the Tfal Perfect Steak Pan. I tried calling their customer service and they kept disconnecting me so I hope you can answer my question. I haven’t tried it yet. When I go to set the timer for beef and thickness to 1 inch and how you want it done to Well. It comes up 25 seconds for each side. How can a steak get done on 25 seconds on each side? Is it because the pan says to put a steak in the pan when the arrow on the pan is in middle of red and it is very hot so it doesn’t need to cook longer then 25 seconds on each side? Please answer my email since their customer service isn’t working. Thank you. I’m sorry this isn’t a product I have tested. If you want steak rare and it is a very thin steak, it is possible for it to cook very quickly, but you are best to check the product manual. Tefal’s customer service is usually great, so check you are dialling the correct number / emailing the correct address.